Delia’s, or maybe ‘Delia Day’, was a ladies fashion shop in North Street, a few doors down from the side exit door of the Regent Ballroom. One day, there in the window of Delia’s, was a cute little dress right on the front model. Grey tweed cloth, short sleeves, round neck, fitted till below the bottom then pleated to flare till just above the knee and only costing 19s-11d, (one penny short of a pound). I had not long started work and as an apprentice window dresser aged 15 and received only £2.10.00, (two pounds ten shillings), a week. The dress was quite a big expense, but Thursday night at the Regent Ballroom was looming and it was a special dance night, ‘Valentine’s Day’ perhaps. The dress was quite sophisticated but fun, elegant, demure, and, fitted like a glove. I took the plunge, paid and rushed home. After tea, with a fresh lick of make-up and a quick change into my new dress I felt very grown up. I trotted off to call for my two girlfriends before catching the bus out of Hollingbury to town for our great dance night. I walked from Rotherfield Crescent down to Carden Hill where my friends would be waiting for me. We would spend some time checking out our hair styles together. Mine was bouffant, Helen Shapiro style. All this ‘glamorising’ would take place in my friend’s tiny bedroom listening to the sultry tones of Elvis crooning to his leading lady in ‘GI Blues’. The story is quite good so far but on arrival at my friend’s house, she opened the door and my jaw dropped. There she stood in MY dress. I could not believe my eyes. She had spotted the dress, like me, in the front window of Delia’s and decided this was what she wanted for our special night. Oh Horror! What was to be done? Neither of us wanted to change and if we did what would we change into now? There was no other choice but to go out looking like twins and feeling not quite as special as when I’d left my house. What is even worse is that the three of us spent most of the evening dancing with each other. I wonder how funny that looked. Two girls wearing the same dress and dancing together! What a wonderful story, it really made me chuckle; poor you! Thanks for sharing this. I recall many of us in this time era used to wear similar clothes if not identical, I think it was something to do with enjoying our best friends. I bet the dresses looked great. 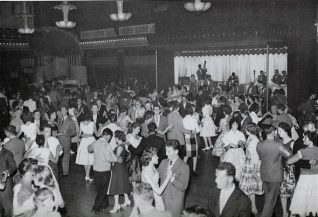 I used to attend the dances, and always danced on the right hand side of the band. Sometimes Brighton football team players would be sitting near the bar, always good for a cuddle and compliment. I was lucky enough to have a job Working for Ted Holgate and his wife near the Fishmarket on the seafront. Tthat was before I had a full time job, so all my earnings went on clothes it was usually Lewis’s of North Street but then the Sample Shop opened next the coffee grinding shop in Sidney Street and I wore something different as they were most of the time one offs. I remember two lovely girls who dressed alike every week at the Regent. They would dance together and I never saw any guys dance with them. My mate and I chanced our arm one Thursday and did dance the whole evening with them; they were gorgeous. We offered to take them home after, they agreed. We then found out they lived in Moulsecombe, we lived in Portslade. That was a long walk home. The one I partnered ended up marrying another of my mates. I think her name was Jean. Happy days!